tinyTesla is the DIY mini musical Tesla coil kit that anyone can build. Heat up your soldering iron and prepare your tools! Once complete, tinyTesla shoots four-inch sparks, plays music and wirelessly excites fluorescent tubes. The completed kit shoots sparks up to 4 inches long! 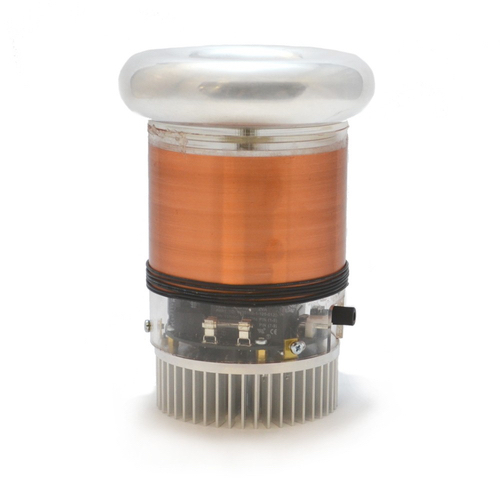 tinyTesla is the first of its kind as a USB-controlled Tesla coil kit. The interrupter connects directly over USB to a Windows, Mac, or Linux laptop and operates as a standard USB MIDI device. This means it will work with your favorite MIDI software out of the box. We also offer a downloadable, simple-to-use control panel for basic song playback and MIDI analysis.